DeKalb County has recently completed a transportation plan that will prioritize developments until the plan is again reviewed in five years. Starting in late 2012, the County hosted a variety of meetings and online surveys (as advertised here and here), and the result is their 2014 Transportation Plan Draft Recommendations Report. The report emphasizes that in order to remain competitive with other regions of the country and leverage existing strengths, DeKalb must invest in transportation upgrades. It is also noteworthy that "because of the strong interest expressed by policy makers, stakeholders and the public concerning safe and efficient travel for alternative modes, including for bicyclists, pedestrians, and transit users, a Complete Streets Policy has been developed as a standalone formal policy document..." The plan draws input from representatives from a variety of government agencies, cities, community investment districts and the Atlanta Regional Commission. Overall, the project aims to improve mobility for all people (using all transport modes); enhance quality of life (via improved multimodal safety and preservation of community attractiveness and character); improve economic viability (by enhancing transport for all stakeholders); and focus on implementation (maintain existing resources, identify new projects and funds to develop them). The report explains how projects are being prioritized. Below are a few maps zoomed to our area. 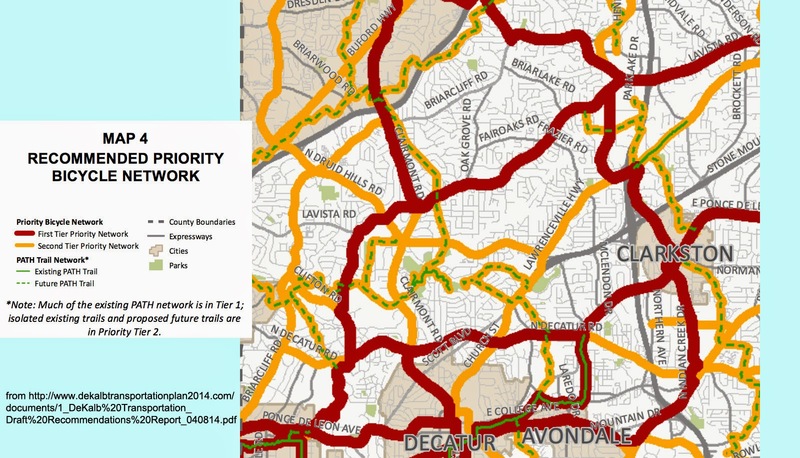 for an expanded and cohesive county wide bicycle network. Some portions of this network already exist; others... may prove unfeasible... The envisioned network will need to be revised with future transportation updates. ... Although there is no set timeframe.... many segments shown in the network are also included in projects on the recommended list of priority projects developed as part of this Transportation Plan." Several of the future PATH trails in the map above fall under Tier 2 and Tier 3 recommendations (i.e., lower priority). Page 36 outlines Tier 1 (priority) projects by mode. In our neighborhood, project 1591 refers to an extension to the South Fork of Peachtree Creek's PATH. Expansion of the South Fork of Peachtree Creek PATH. 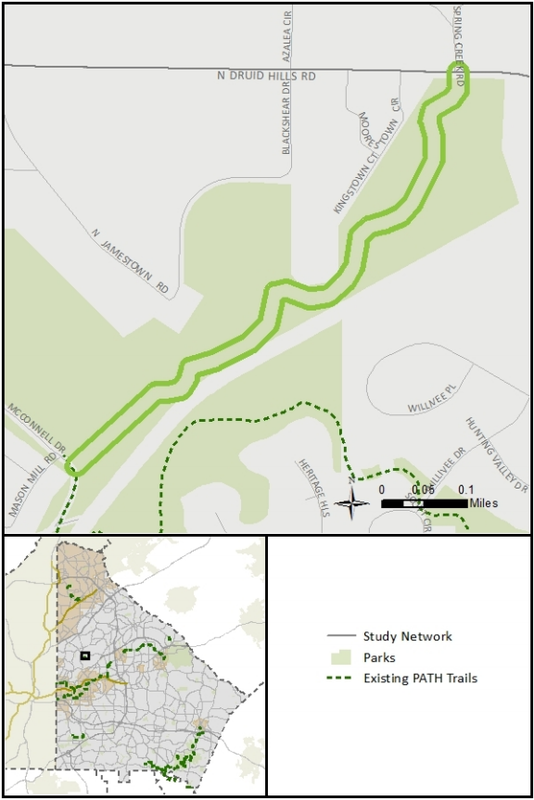 The fact sheet for project 1591 can be found on page 112 of the Fact Sheet Report This project will connect the existing trail end at Mason Mill Park to North Druid Hills Rd. from page 35 of DeKalb's 2014 Transportation Plan. 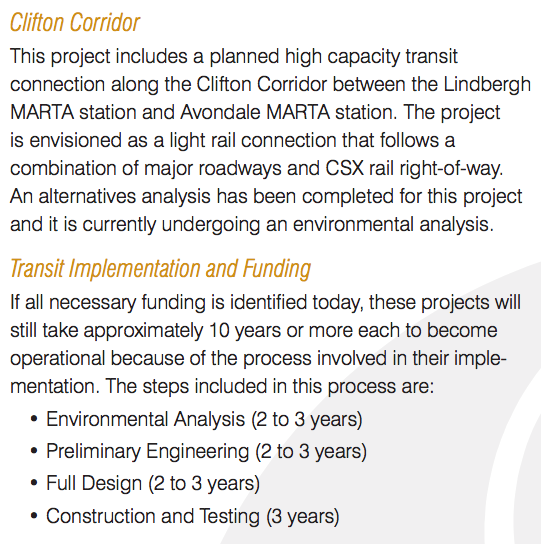 Page 35 describes the Clifton Corridor's light rail plan, noting a 10+ year window (assuming funding were available). The Appendix to this report is available here and includes information on the complete streets concept, additional maps and specifications for proposed improvements, and a comprehensive project list. For additional details and documents, visit the DeKalb transportation plan website.